Chinese President Xi Jinping arrived in Africa on Saturday for a four-nation visit during which he will be seeking deeper military and economic ties. It is the first overseas trip of Xi’s second term as president. In Senegal, the first leg of his Africa tour that will also take him to Rwanda and South Africa, the Chinese leader signed bilateral deals with the West African nation. Details of the agreements signed were not immediately released, but the Chinese foreign ministry said the country promised to support Senegal in the areas of general development, as well as anti-terror, peacekeeping and maintaining social stability. 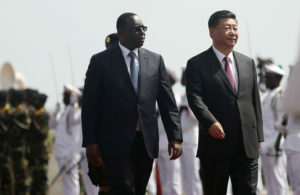 Senegal has become the first African country on the Atlantic Coast to sign up for the “Belt and Road Initiative.” The initiative aims at building a transport network connecting China by land and sea to Southeast Asia, Central Asia, the Middle East, Europe and Africa. China has pledged $126 billion for the plan. Under Macky Sall, Senegal has engaged in an ambitious Plan for an Emerging Senegal, which wants to see a major economic and infrastructural overhaul by the year 2035. China’s loans have financed a highway linking capital Dakar to Touba, Senegal’s second main city, and part of an industrial park on the Dakar Peninsula, making China the first foreign investor in the country. China’s ambassador to Senegal Zhang Xun in March said China had invested $100 million in Senegal in 2017. President Sall told reporters he discussed with his guest “bilateral cooperation, Sino-African relations and international current affairs”, hailing China as “one of the great economies of the modern era”. Africa represents only 4% of Chinese international trade, while China’s presence has allowed Africa to become more dynamic and to diversify the pool of its economic partners. Posted by Geraldine Boechat on July 23, 2018. Filed under Business. You can follow any responses to this entry through the RSS 2.0. Both comments and pings are currently closed.